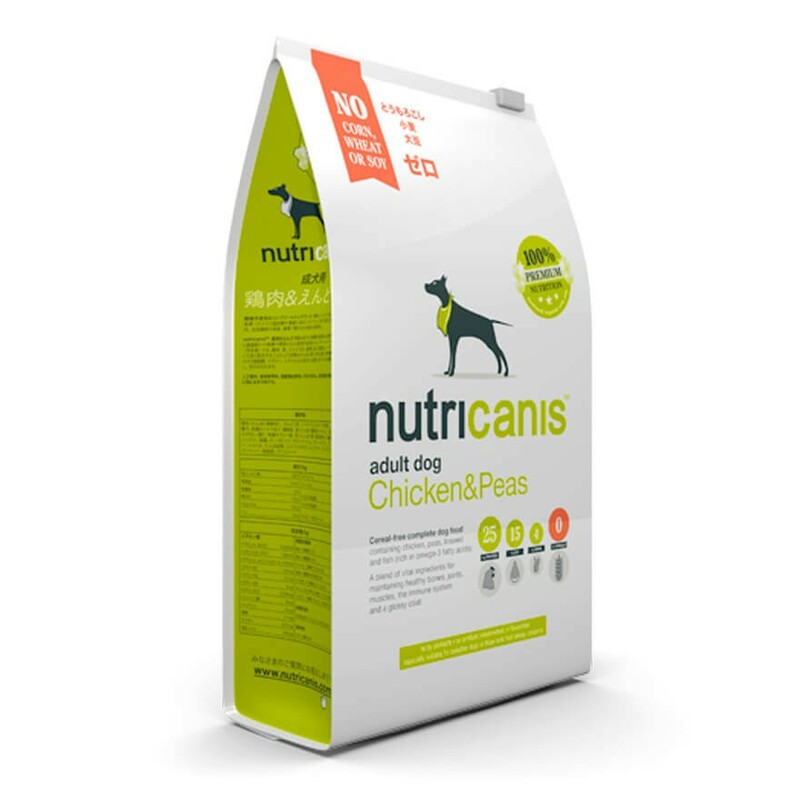 Nutricanis Chicken & Peas provides your dog with everything he needs on a daily basis. 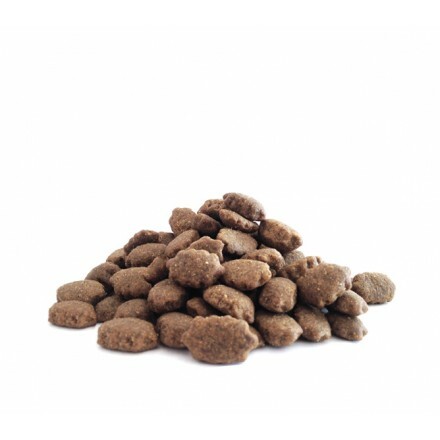 The high-quality, grain-free/cereal-free and gluten-free complete food is designed to meet the energy requirements of a normal-weight, adult dog. It contains many premium ingredients that will help him to stay healthy and fit for longer. The special resealable packaging helps keep the food fresh and retains its great taste as you use it. 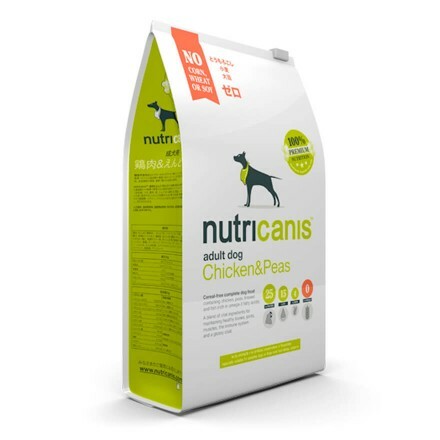 Our grain-free/cereal-free and gluten-free Nutricanis dog food has been developed with the help of experts to ensure a species-appropriate diet for your best friend and contains a special blend of ingredients selected for optimal tolerance and a low allergy risk. 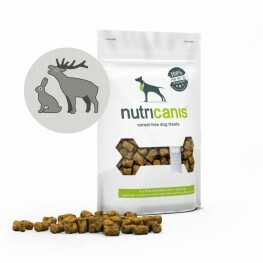 Nutricanis is enriched with herbs that naturally support the health of your dog – the trace elements and antioxidants they contain gently boost the immune system and protect the cells. 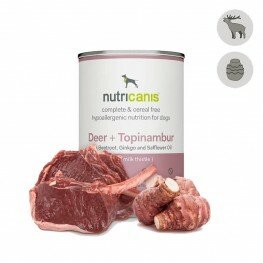 Rich in high-quality proteins – ideal for feeding active, adult dogs. 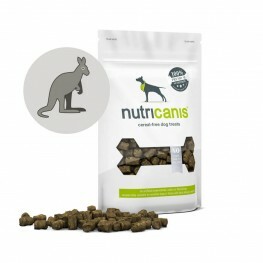 The high protein content provides your dog with essential amino acids and strengthens his muscles. 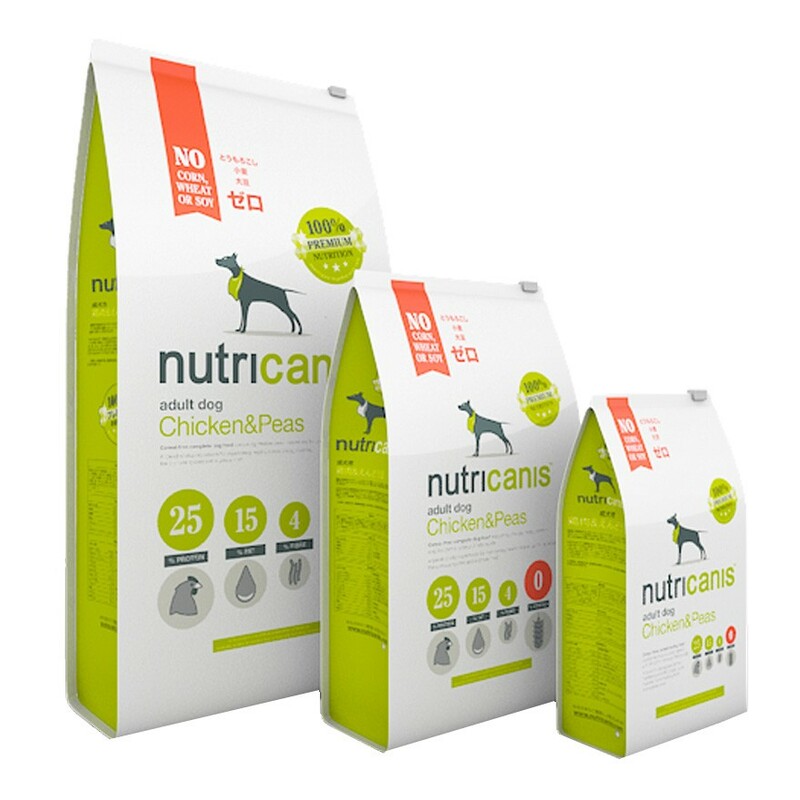 Nutricanis Chicken & Peas has been developed in line with the latest nutritional findings. It is completely free from grain/cereal and gluten, as these can cause intolerances and allergies. Instead, peas and potatoes provide high-quality carbohydrates and fibre (4%) to aid nutrient absorption and digestion. 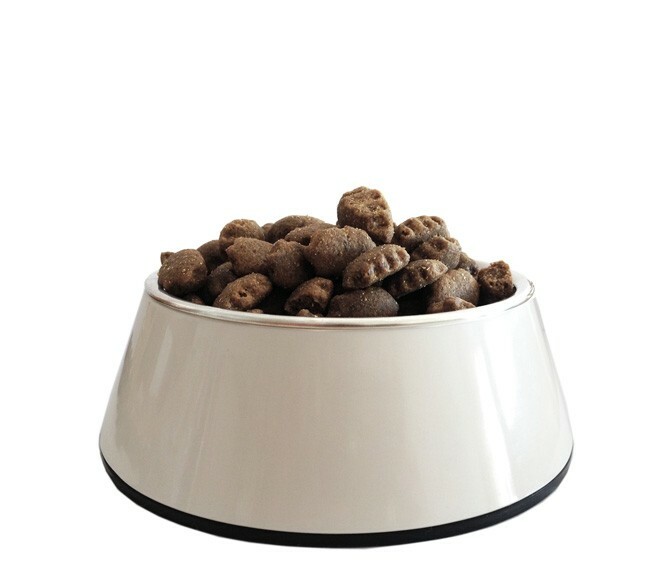 Nutritionists consider potatoes the best source of carbohydrates in dog food. Peas are high in vitamin C and their fibre content counteracts high cholesterol levels. The chlorophyll that makes peas so green is considered to have anti-carcinogenic qualities. Potatoes provide valuable carbohydrates, fibre, and starch. They are also rich in vitamins such as vitamin C, vitamin K, and B vitamins. In addition, potatoes supply essential minerals such as sodium, potassium, magnesium, calcium, phosphorus, iron, and zinc. Peas have anti-inflammatory properties. They contain antioxidants such as alpha- and beta-carotene, which protect the body from free radicals. Peas are a good and well-tolerated source of energy. They provide high-quality fibre, which is important for digestion. The polyphenol contained in peas is believed to protect against cancer and vitamin K and B are important for the bones. Peas also contain phosphorus (important for the energy metabolism of the body's cells), thiamine, and potassium. Nutricanis Chicken & Peas contains a high percentage of tasty chicken meat – a source of important animal proteins – and no cheap slaughterhouse waste. The overall high protein content of at least 25% contributes to the efficiency of your dog’s muscles. Chicken meat is rich in protein, low in fat, easy to digest, and contains relatively high levels of potassium, magnesium, and zinc. Potassium has a positive effect on the nerves and heart muscles, magnesium supports heart and muscle function, and zinc is good for the immune system. Chicken meat also contains B vitamins, including folic acid. B vitamins support bodily functions, particularly metabolic processes, healthy growth of the skin and coat, and blood formation. In order to ensure you can give your dog the very best, the premium formula contains additional, carefully selected ingredients: The balanced complex of vital substances is rich in valuable polyunsaturated fatty acids omega-3 (more than 7 g/kg) and omega-6 (more than 23 g/kg), which support the strengthening of joints and contributes to a shiny coat. The fatty acids contained in Nutricanis Chicken & Peas are of high quality and originate from fish oil and flax seeds. 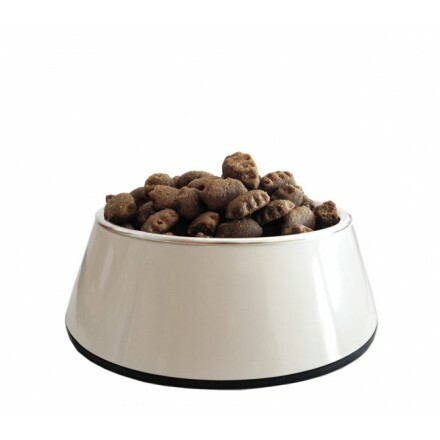 Vegetable ingredients are also highly important within your dog’s diet. 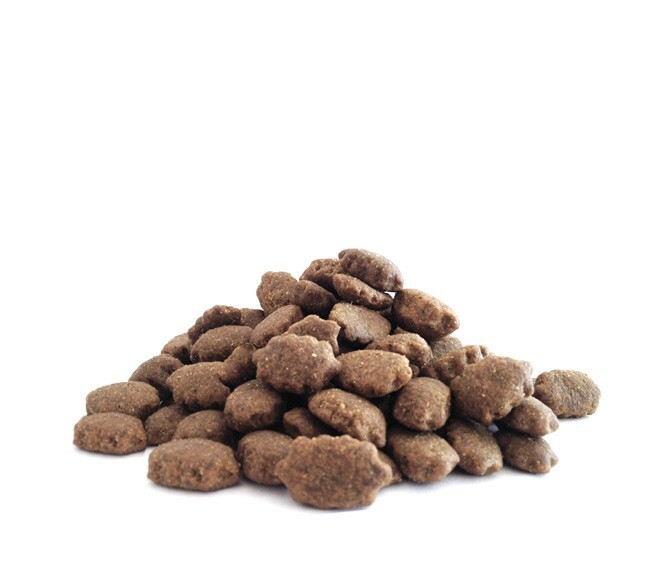 As a premium dog food, Chicken & Peas contains a special selection of health-promoting herbs: cleavers, seaweed, nettle leaves, dandelion root, hawthorn leaves and aniseed may sound exclusive, but provide important minerals and trace elements such as calcium, magnesium, folic acid and iron. They also have positive effects on metabolism. Blueberries, another special ingredient, have cytoprotective properties – they contain more antioxidants than garlic. Nutricanis Chicken & Peas contains no cheap fillers, no artificial preservatives, no artificial colours or sweeteners - only the best, well-tolerated ingredients. As a matter of course, we disclose 100% of the ingredients we use. 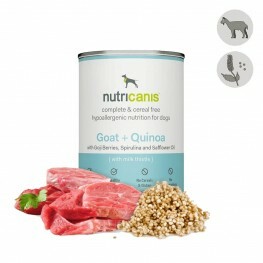 Nutricanis dog food contains only the ingredients listed on the package. All of our products are developed without animal testing.